Home / Online Deals / Online Deals / Lillebaby Baby Carriers on Sale up to 65% Off Today Only!!! Have you been looking for a carrier for your baby? We have Lillebaby Baby Carriers on sale today, and you can get these for as much as 65% off! This Ring Sling with Removable Pocket is great because you can use the pocket to hold things and really be hands-free. Get this for $34. I love the anchors on this Airflow SIX-Position 360° Ergonomic Baby & Child Carrier. This carrier is made from durable 3D mesh fabric to give you maximum ventilation and temperature control for all-weather wearing. This one is on sale for $52.89. And, kids will love this Disney Baby Collection Doll Carrier because your little girls can use it to carry their dolls and stuffed animals just like you carry your baby. Get this for $21. 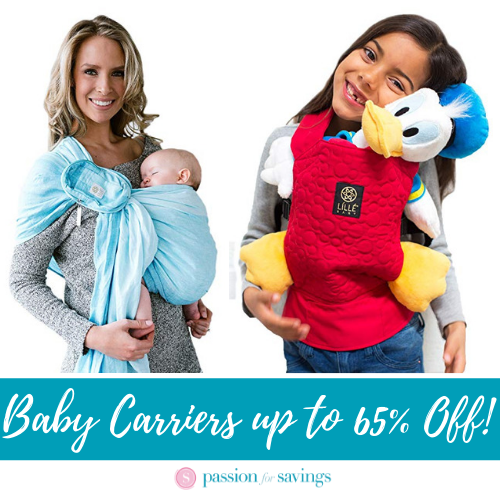 Don’t miss out on these Lillebaby Baby Carriers on sale today! Amazon.com Price: $34 (as of 02/24/2019 10:10 CST) Product prices and availability are accurate as of the date/time indicated and are subject to change. Any price and availability information displayed on Amazon.com at the time of purchase will apply to the purchase of this product. We are not responsible for and cannot control changes in pricing and availability, these change frequently so we recommend that you always double check the price before making a purchase. Best Deals on Hefty Trash Bags | $0.10 Per Bag!